Twenty-five years ago, when our small group of Boston therapists began meeting to discuss how we might apply ancient Buddhist meditation practices in our work, we didn’t often mention it to our colleagues. Most of us had trained or were working in Harvard Medical School facilities, and the atmosphere there was heavily psychoanalytic. None of us wanted our supervisors or clinical teammates to think of us as having unresolved infantile longings to return to a state of oceanic oneness—Sigmund Freud’s view of the meditation enterprise. During the subsequent decade, while the therapy and meditation communities continued to show little interest in each other, mindfulness meditation was making inroads into the medical community. This was largely through the efforts of Jon Kabat-Zinn, who, beginning in 1979, had adapted ancient Buddhist and yogic practices to create Mindfulness-Based Stress Reduction (MBSR) at the University of Massachusetts Medical Center in Worcester. This standardized, 8-week course couched meditation practices in Western, scientific terms. Their working definition of mindfulness—“the awareness that emerges through paying attention on purpose, and nonjudgmentally, to the unfolding of experience moment to moment”—made the concept readily accessible. The first use of mindfulness in psychotherapy to capture widespread attention among clinicians was Marsha Linehan’s Dialectical Behavior Therapy (DBT), introduced in the early 1990s to treat suicidal individuals with complex disorders for which little else seemed to work. The central dialectic in DBT is the tension between acceptance and change. In searching for a means of helping therapists and their clients to experience what she called “radical acceptance”—fully embracing helplessness, terror, losses, and other painful facts of life—Linehan drew on a number of mindfulness practices from Zen traditions and Christian teachings. In a 2007 survey conducted by the Psychotherapy Networker, 41.4 percent of the nearly 2,600 therapists who responded reported that they were practicing some form of “mindfulness therapy.” Mindfulness-based treatments are now being introduced into graduate programs, are frequently discussed at academic conferences, and are a constant on the workshop circuit. Is this just a passing therapy fad? If so, why has it taken off so rapidly? Is it another therapeutic bubble? Or has the field really stumbled upon something that has the potential to fundamentally change the way we practice? Several explanations of the explosion of interest in the integration of mindfulness practices and psychotherapy have surfaced. 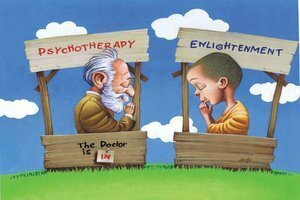 One dates back to counterculture days: a lot of baby boomers back then experimented with consciousness-altering substances and practices, eventually turned to meditation, and later became psychotherapists or psychological researchers. Now that they’re the elders, they’re coming out of the closet in droves. Another explanation relates to the evolution of behavior therapy, which involves three major developmental phases. The first, behavior therapy proper, was classical conditioning and behavior modification. As time passed, behavioral clinicians realized that these approaches, based on animal learning, miss something vital about human beings: we think and feel a lot. So CBT was born, based on the idea that we can use learning theory to modify patterns of thoughts and feelings, and by doing so, improve both behavior and subjective experience. It soon came to dominate the psychotherapy world. When we understand how our cultural identity shapes our beliefs, we can begin to help our clients explore theirs. Here's a FREE printable worksheet to help you get started. Another factor behind the popularity of the mindfulness movement involves the mainstreaming of ancient mind-training disciplines like yoga and tai chi, which only “counterculture types” once practiced. Now virtually every health club and community center offers classes, and participants include athletes, artists, lawyers, and business executives. This trend has ushered in openness to ideas from Eastern wisdom traditions, which have trickled into the medical field. The most compelling argument supporting the use of mindfulness practices to treat a wide range of disorders is based on evolutionary psychology: we didn’t evolve to be happy. In this line of reasoning, mindfulness practices were first developed in ancient times to counteract vestigial neurobiological mechanisms that make us miserable, and these same practices can be successfully adapted in modern psychotherapy to the same ends. Proponents claim that mindfulness practices actually address all of these evolutionary difficulties. First, they mitigate our propensity to dwell in painful thoughts by redirecting attention out of the thought stream toward awareness of sensory experience. Most practices begin by developing concentration: we direct our attention to the breath, the feeling of the soles of the feet contacting the ground, the sound of a bell, or some other set of sensations. Each time we notice that the mind has left its focus and been hijacked by a train of thought, we congratulate ourselves for noticing, and gently bring our attention back to the moment-to-moment sensory experience. We then repeat this about a billion times. The result is that we begin to see thoughts as secretions of the mind, arising and passing like clouds moving across a vast sky. We stop believing in them as we once did. That, in turn, lessens their grip and reduces our emotional reactivity to them. Is This Really a Good Marriage? The future of the integration of mindfulness and psychotherapy will depend on whether clinicians choose to use these practices for spiritual growth, inviting their clients to do the same, or teach these techniques to clients as a gateway to symptom reduction. If we head down the spiritual path, therapists will be faced with the question of how or when to address the transformative potential of these practices with their clients, or to speak of the insights they can yield. For example, if a client is grieving the loss of a love relationship, pointing out that everything changes and that there’s no way to hold onto anything will probably result in a terrible empathic failure or encourage the client to perform what psychologist and Buddhist teacher Jack Kornfield calls a “spiritual bypass”: escaping a painful emotion by defensively acting as though we’ve transcended such petty worldly reactions. Then again, there are moments in treatment when it may be beneficial to help clients understand that clinging to pleasure and pushing away pain multiplies our misery, or how transient life events and feelings really are. Figuring out when to stay empathically attuned to clients’ narratives and when this keeps them stuck in a relative truth is beginning to enter clinical discussions, and is likely to be of continuing interest to therapists who want to use mindfulness for more than just symptom alleviation. Ronald Siegel, PsyD, an assistant clinical professor of psychology at Harvard Medical School, is author of The Mindfulness Solution: Everyday Practices for Everyday Problems, coeditor of Mindfulness and Psychotherapy, and most recently, coauthor of Sitting Together: Essential Skills for Mindfulness-Based Psychotherapy. This blog is excerpted from "West Meets East" by Ronald Siegel. 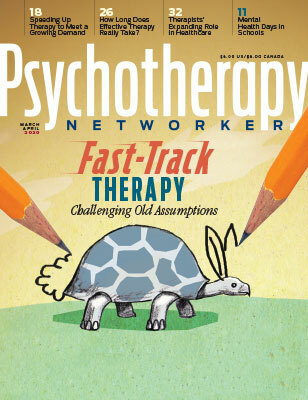 The full version is available in the September/October 2011 issue, The Mindfulness Movement: Do We Even Need Psychotherapy Anymore? The Hakomi Institute has been teaching the use of mindfulness, somatic awareness and psychotherapy throughout the world since 1978. It is one of the most developed and grounded approaches out there. The Comprehensive Training changes therapists, creates a healing learning community with an excellent faculty. Please see our new text: Hakomi: Mindfulness-Centered Somatic Psychotherapy (Norton). Wonderful article! I completely agree. Mindfulness meditation helps deal with everyday problems from losing their job to traffic jams to stubbed toes. I have been practicing mindfulness meditation for almost 2 years and have seen incredible outcomes. Before I sit down in the morning for my daily practice, I am reminded of Lao Tzu, "To the mind that is still, the whole universe surrenders." What book would you recommend on meditation? I always enjoy reading Ron Siegel's thoughts and I appreciate the challenge of integrating mindfulness with psychotherapy. I' like to note that in John Welwood's edited book, Awakening the Heart: East/West Approaches to Psychotherapy and the Healing Relationship (Shambala 1983), he compiled the "first book to concretely explore how meditative and contemplative practices can inform and provide a larger context for the healing relationship." Welwood states for change to occur in psychotherapy, it would seem essential that "clients speak from their immediate experience, rather than from familiar thoughts, feelings, beliefs or judgments about their experience." He recommended communicating from what Eugene Gendlin calls a felt sense. Mindfulness techniques are like anything else: how useful they are depends on the questions, "for whom," and "for what purpose." They are useful for helping people relax when faced with things they cannot change, or for taking action to change things when doing so provokes anxiety. They are not useful in, for example, their use for physicians encountering stress because of the horrible behavior of managed care managers. These managers are now actively using it, ostensibly for countering physician burnout, when the real reason is to make everyone shut up and think that their problmes the office policies are merely a reflection of their own poor distress tolerance skills.